(News Investigators) /The National Judicial Council (NJC) says it stand by its recommendation to President Muhammadu Buhari that Justice Uwani Abba-Aji be approved as justice of the Supreme Court. Just as it re-affirmed the Chief Justice of Nigeria (CJN), Walter Samuel Nkanu Onnoghen’s commitment to zero tolerance for corruption. The NJC was reacting to a report by a civil society organization, Civil Society Network Against Corruption in which it urged Mr. Buhari not to forward Mr. Abba-Aji’s name to senate for confirmation until he purged himself of alleged corruption. The NJC, in a statement by its Director of Information, Soji Oye, said in Abuja Wednesday that there was no pending charge against Justice Abba-Aji following his clearance by security agencies after interrogation. The group had premised its objection to Mr. Abba-Aji appointment on a 2016 online media report (not News Investigators) which featured his name as one of the Judicial Officers under investigation for corruption by security agencies for accepting bribe from a senior lawyer who is currently facing trial at the law court. It also threatened to would challenge the action in Court should the President fail to accede to their demand. The statement said that in as much as it would “not join issues with anyone on this matter, it is necessary to put the records straight. Members of the public would recall that sequel to the request of the Attorney-General of the Federation, in 2016, Hon. 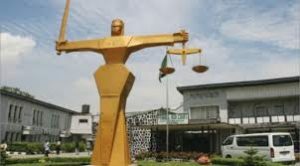 Mr Justice Abba-Aji and seven (7) other Judicial Officers were directed by the Council to recuse themselves from performing their judicial functions pending their investigation by Security Agency. “Hon. Mr. Justice Abba-Aji and five (5) others were recalled as only three (3) out of the Judicial Officers then under investigations were arraigned in Court. “For the avoidance of doubt, Hon. Mr. Justice Abba-Aji has since been sitting in Court and no Investigation Agency has filed any new allegation against His Lordship, in fact, his international passport had been returned to him and he had been travelling outside the country without any hindrance, signalling that the investigation agencies have nothing new against His Lordship,” Mr Oye said. Adding that, the law of the land remains that no one is to be punished except for an offence established by due process of law. “The National Judicial Council hereby re-affirms its commitment to zero tolerance for corruption which is the stand of The Honourable, The Chief Justice of Nigeria and Chairman of the Council, Hon. Mr. Justice Walter Samuel Nkanu Onnoghen, GCON,” he said.